is there a twist to lock device in the end of the shaft??? you could also .. with some searching.. find a 5/16-16 flat headed knob.. and use that to give you adjustability... how that will work with the horn there??? there are various other designs of telescopic wheel locks that might be able to be hidden behind the horn button and still stick out behind the wheel... something i have NOT tried... almost every caddy has a teloscopic column.. so you might be able to use some parts for a caddy..
now.... depending upon the steering wheel.. there are Grant steering wheel adaptors... for telescopic columns and some of their wheels..
part number 6400 fits GM telescopic installation kit. Black wrinkle finish. For use with Grant signature series steering wheels on GM cars with telescopic steering columns. Designed for 1984 to 1989 models with 2 in. travel. Will fit older models but will limit travel to 2 in. Fits signature series 5-bolt wheels only. 6401 GM telescopic installation kit. Black wrinkle finish. 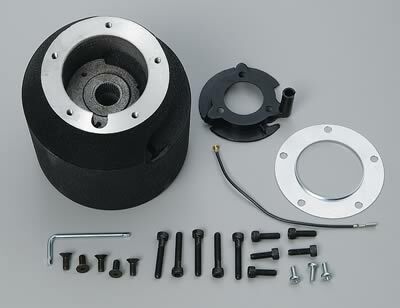 For use with Grant signature series steering wheels on GM cars with telescopic steering columns. Designed for 1969 to 1983 models with 3 in. travel. Fits signature series 5-bolt wheels only. there are more parts with it..
here is another picture.. but it still needs the GM center screw with the adjustable plate.. Does anyone out there have one of these they have been discontinued and I can't find one anywhere. Desperate!!! pick up the print issue.. probably have to find a copy of VETTE magazine.. as that should still be on the stands..
if those don't work out..
there are dozens of corvette used parts suppliers. one of them might have a used column that has a wheel adaptor on it..
i seem to recall that gm had 6 bolt steering wheels also in corvettes earlier than this. mslack1.. log in.. check private messages to the left of where you log out..